The Duke and Duchess, along with Prince George and Princess Charlotte, today arrived in Poland for the start of their Royal Tour of Poland. Katherine departed the plane in a white Alexander McQueen peplum dress while carrying Charlotte. 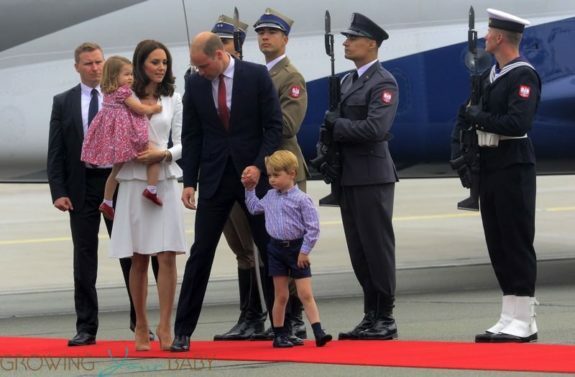 William accompanied son George as the family posed for the cameras outside the airplane. Tomorrow William and Kate will travel to the Stutthof concentration camp and Gdansk’s shipyards, before heading to Germany later on in the week.